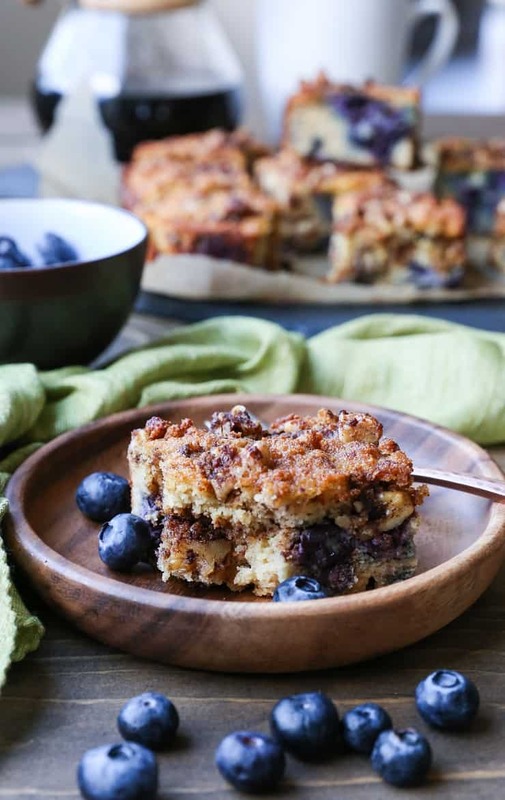 Moist, fluffy, cinnamony paleo blueberry coffee cake made with coconut flour, almond flour, and pure maple syrup. This flavorful cake is perfectly healthy for breakfast, yet sinfully taste enough to enjoy as dessert! One of my favorite parts about summers in Reno is opening the windows at night to let the cool air in, then enjoying my steamy mug of bulletproof coffee in the morning with the desert breeze coming through the windows. It’s these little stolen moments that allow me to slow down and enjoy the feels, regardless of what’s on my To Do list, or what’s on my mind. 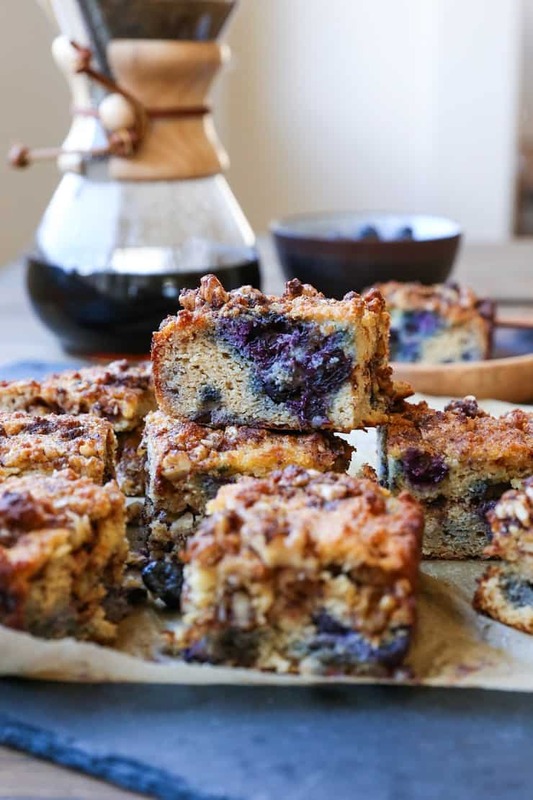 My latest favorite treats to join in those stolen moments are the Keto Fat Balls, Paleo Chocolate Chip Edible Cookie Dough, Vegan Strawberry Cheesecake, and most recently, this Paleo Blueberry Coffee Cake. There’s nothing like allowing yourself to indulge in something simple, healthful, yet gratifying. Every once in awhile, there will be a recipe that pops up in my head that I JUST HAVE TO MAKE. 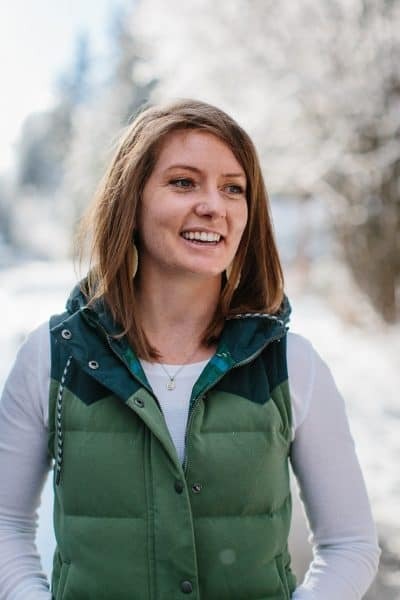 For the most part, I plan recipes that go up on this site well in advance, and I base them off of special diets (vegan, vegetarian, or paleo) as well as what I’m craving, but from time to time, something will slamdunk me in the brainsocket and stay at the forefront of my lobe until I up and make it. This paleo blueberry cooffe cake was definitely one of those! You see, for whatever reason, I crave sugar like crazy during the summer, and I was experiencing an epic craving for the Paleo Coffee Cake I posted a few years back. As luck would have it, I had a bunch of blueberries that needed to be used up…so I thought plunking them down in a cinnamon-swirly cake of bliss would be the perfect answer to the bloob dilema. And you know what? It was! I based this paleo blueberry coffee cake off my original recipe, but took a different approach this time around. I used almond flour rather than arrowroot flour – initially, I was concerned the cake wouldn’t turn out as fluffy, but the texture turned out phenomenally! 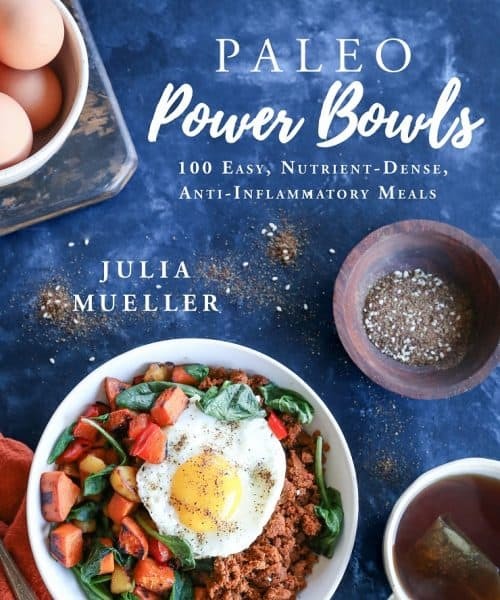 For those of you who don’t bake with starches or gums, it should come as a relief that you can definitely make grain-free paleo coffee cake without the necessity for them! Prepare the coffee cake batter and the walnut cinnamon swirl topping mixture – I prepare the cake batter in a blender and the topping in a food processor, but you can do either/or. Pour half to two-thirds of the coffee cake batter (which will be super thick) into a prepared 8” x 8” baking pan lined with parchment paper. Spread half to two-thirds of the walnut cinnamon swirl mixture over the cake batter layer and use a butter knife to smear the two into a swirly concoction. Repeat for the remaining coffee cake batter and the cinnamon topping mixture. Word to the wise: Allow the coffee cake to sit until it cools all the way to room temperature once it’s out of the oven. It will hold together much better after it sets up! Of course, coffee cake is designed to be crumbly, so a little crumbliness is normal, but you want to make sure you can cut nice big hunks of the cake without it falling apart. For a cake that’s lighter in texture, replace the almond flour with tapioca flour. My favorite part about this coffee cake is it goes so well with life in general. I love eating it as an afternoon snack with tea, but it’s also a great breakfast or brunch item. Dessert? Youuuu betcha! Make it a part of your stolen moment session! 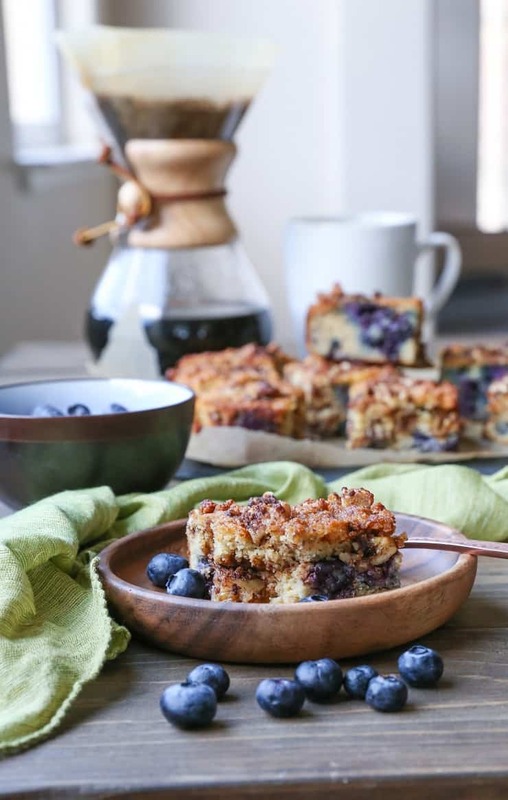 If you make this Paleo Blueberry Coffee Cake, please feel free to share a photo and tag @TheRoastedRoot on Instagram! 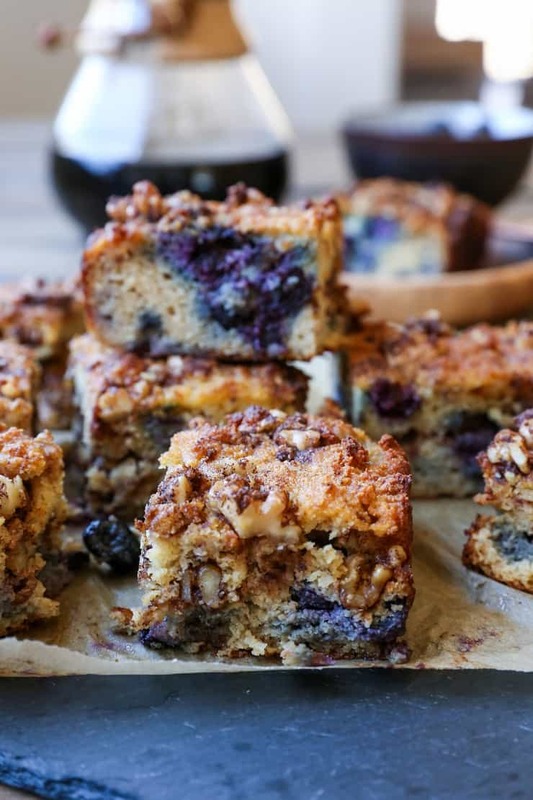 Add the ingredients for the coffee cake, except for the blueberries, to a blender. Blend until combined and smooth. Note: the cake batter will be very thick - this is normal. Toss the blueberries with 1 tsp coconut flour in a small bowl to ensure they won't all sink to the bottom of the coffee cake. Fold the blueberries into the coffee cake mixture. Stir the ingredients for the walnut cinnamon swirl topping in a small bowl until well-combined. Pour 1/2 to 2/3 of the cake batter into the prepared cake pan and smooth into an even layer. Evenly spread 1/2 to 2/3 of the walnut topping mixture on top of the cake batter and use a knife to swirl it into the batter. Repeat for remaining cake batter and walnut topping. Bake on the center rack of the preheated oven 30 to 35 minutes, until set up in the center and the edges are golden-brown. Turn off the oven and allow the cake to sit 5 to 8 minutes more in the hot oven. This looks so delicious! 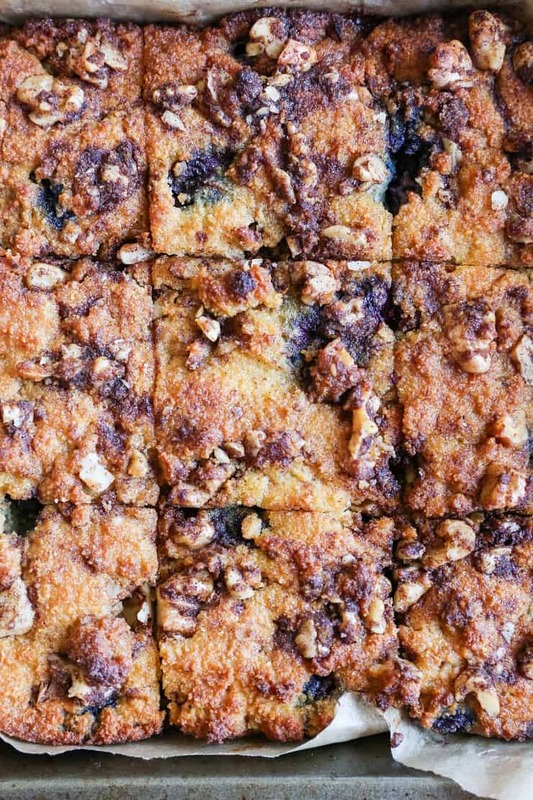 Love the celebration of fresh blueberries and that you used coconut flour to keep it paleo 🙂 Also I’m the biggest fan of both walnuts and streusel so this sounds incredible! This recipe is definitely a slam dunk! I really need to experiment more with different flours…I have to admit that I’m at a loss when it comes to coconut flour and in general baking gluten-free. This is the place I need to start because blueberries are my jam! I’m going to grab some coconut flour and make this stat. Please teleport a piece to me right now! The cake looks perfect. 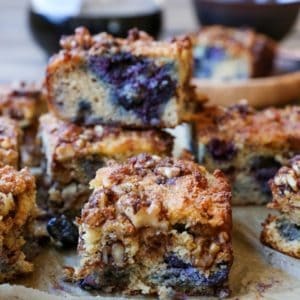 Omg, that looks like some seriously moist coffee cake BURSTING with blueberries!!! I absolutely love the colors in the cake itself….lovely!! I’m SO EXCITED for this delicious cake! I’m passing the recipe along to my mom who will go crazy for it too. She just said today that she’s making your morning glory bread to take with her on vacation. We both agree it’s the best bread EVER! I cannot tell you how excited I am that this is gluten free 🙂 So hard to find good recipes for GF coffee cake! Cannot wait to give this a try! First of all, this coffee cake looks DIVINE. I have been craving blueberry muffins so bad lately, and haven’t done anything about it, except whine that I can’t have them. Hehe. I am going to make this tonight! Second of all, do you think arrowroot powder would work in place of the almond flour? Also, what if you did half almond flour half tapioca (or arrowroot)? Thank you so much for the time you put in to create this beautiful recipe! Do you have the macros for this? I am on Keto, so I am interested in numbers for carbs. Hi Carolyn! I just calculated and posted the macros. Assuming you do 9 slices, it’s 21g of carbs (11g of sugar) per slice 😀 You can absolutely replace the pure maple syrup with a zero-sugar sweetener if you’d like and then add a small amount of additional coconut milk to make up for the loss of liquid. For instance, If I were adding a sweetener like Stevia or Swerve, I’d start with 1/4 cup and bump up the coconut milk measurement to 1 cup. I’d taste the batter for sweetness and add more as necessary. I hope this helps, and I Hope you enjoy! I made this yesterday and it turned out SO delicious! It’s the best paleo cake I’ve ever made, perfect texture (alot of paleo cakes were too crumbly or too ‘eggy’ for my taste) sweetness and taste. I wonder if I can make this without any berries in the winter season, or if it’d work with frozen ones, I’ll definitely try it. Thank you for coming up with such perfect recipe! Awesome! I just made the blueberry one again and it was just as delicious. I’m definitely adding the berry-free one to my recipes to make when I can’t find any more berries to use. I’m going to attempt making your banana pie today, too. Thank you! I just made this recipe this morning with peaches that were overripe. Oh…….my…….goodness. Delicious. I used 3 peaches and added more cinnamon. Was maybe a bit wet because these peaches were so juicy, but wow. Great recipe with the blueberries, but adaptable for sure! A colleague brought this in after his wife made some – I HAD to get the recipe. It’s seriously perfect!! And I don’t use that word lightly! Hi! I can’t wait to make this. Can I substitute almond milk for coconut milk?